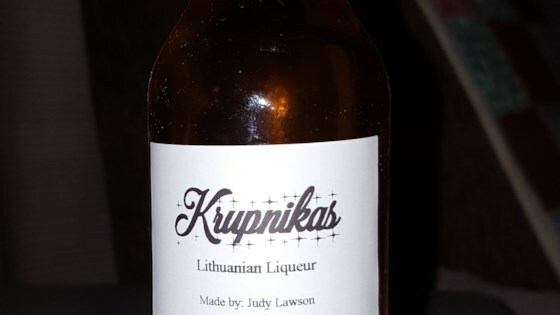 "Lithuanian spiced honey liqueur. Serve warm as a traditional Eastern European cold remedy - a quick heat-up in the microwave works great." Crack the cardamom seeds and nutmeg with a heavy skillet on a cutting board. Toss them into a saucepan with the caraway seed, cloves, allspice berries, cinnamon sticks, peppercorns, saffron, ginger, turmeric, orange zest and lemon zest. Pour in the water, and bring to a boil. Cover, and simmer until the liquid is reduced by 1/2. Strain out spices, and set the liquid aside. Pour honey into a large pot, and bring to a boil over medium heat. Skim off any foam from the top. Stir in the strained liquid from the spices and vanilla extract. Remove from heat and place far from the stove to avoid any flare-ups from the grain alcohol. Slowly stir in the grain alcohol. Place the pot back onto the burner over low heat and cover. Heat through, being careful not to boil or even simmer. Remove from heat and let stand overnight with the lid on. The following day, pour the liquid into sterile bottles, seal, and allow to settle for 2 weeks. The longer you let it sit, the clearer it will become and the better it tastes. Serve warm. Takes awhile to make, but well worth the wait! After the 2 week wait you will not be disappointed! I now make it every winter. I screwed up a bit and used too much honey relative to the alcohol and spiced water, too sweet but still pretty good. It's simply delicious. Try it!